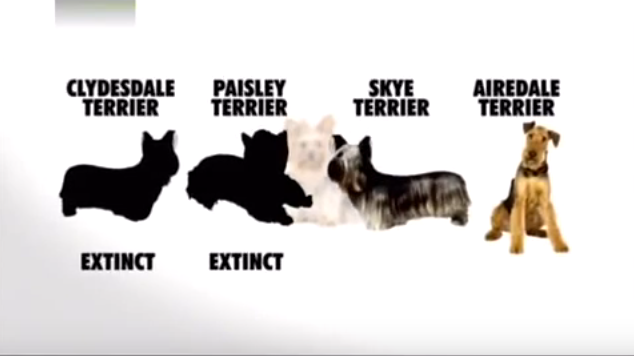 About Yorkshire Terriers and Their History! ​a mixture of 4 dogs. Skye Terrier & Airedale Terrier. These 4 made the Yorkieshire Terriers we have today. Originating in England’s Yorkshire area, the Yorkshire Terrier does not resemble a ratter or a working dog, but it is a combination of both. 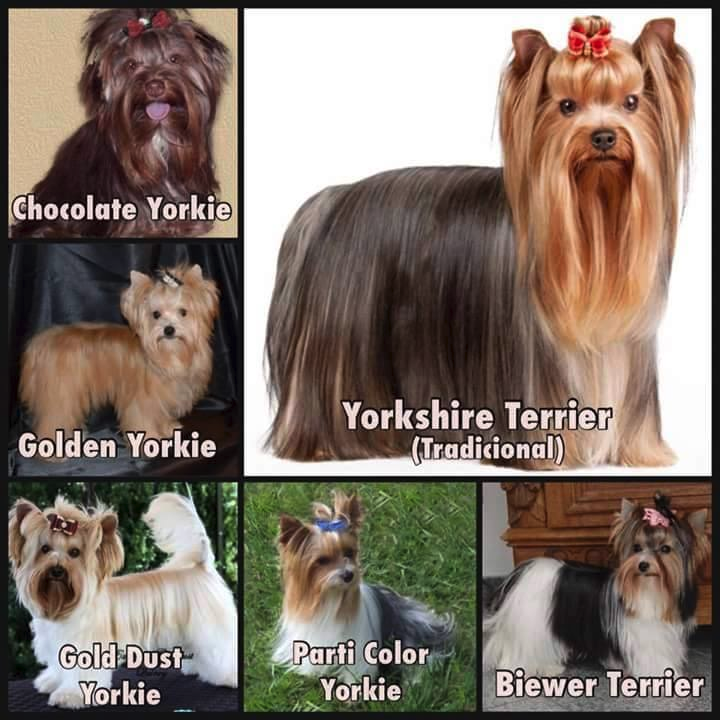 It was believed that the Yorkie was not produced accidentally, but came to be through intentional crosbreeding of a wide range of terriers, including the Clydesdale Waterside, Paisley, Skye, Dandie Dinmont, and rough-coated Black and Tan English Terriers. Among its most important progenitors, the Waterside Terrier was a small blue-gray dog with long hair, weighing between 6 and 20 pounds (most commonly about 10 pounds). It was brought to Yorkshire by weavers who migrated from Scotland to England in the mid-19th century. 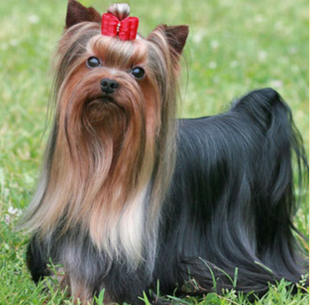 Initially, wealthy dog fanciers despised the Yorkshire Terrier because of its humble roots. However, it wasn't long before the Yorkie graced the stage at dog shows and became the lap dog of choice for the British elite, mostly due to its beauty, elegance, and size. The Yorkie was introduced to the United States in 1872, but there was confusion early on about the dog's standard size. 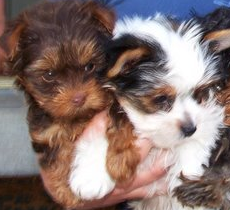 The weight of early Yorkies ballooned to as much as 12 or 14 pounds. By 1900, Yorkie fanciers in England and America set a preferable standard size -- an average of three to seven pounds in weight. The combination of its size and its terrier traits, make this beautiful lap dog a wonderful pet addition for any family today. Because he's so small he often travels in style — in special dog purses toted around by his adoring owner.The long steel-blue and tan coat may be the Yorkie's crowning glory, but it's his personality that truly endears him to his family. Oblivious to his small size (weighing in at no more than seven pounds), the Yorkshire Terrier is a big dog in a small body, always on the lookout for adventure and maybe even a bit of trouble. 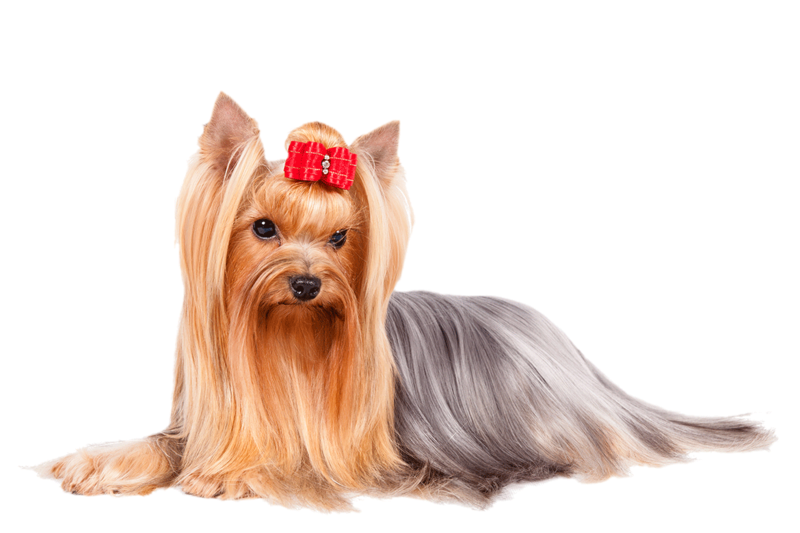 PHYSICAL CHARACTERISTICS: The Yorkshire Terrier has a confident carriage, a compact body, and a sharp, smart expression. 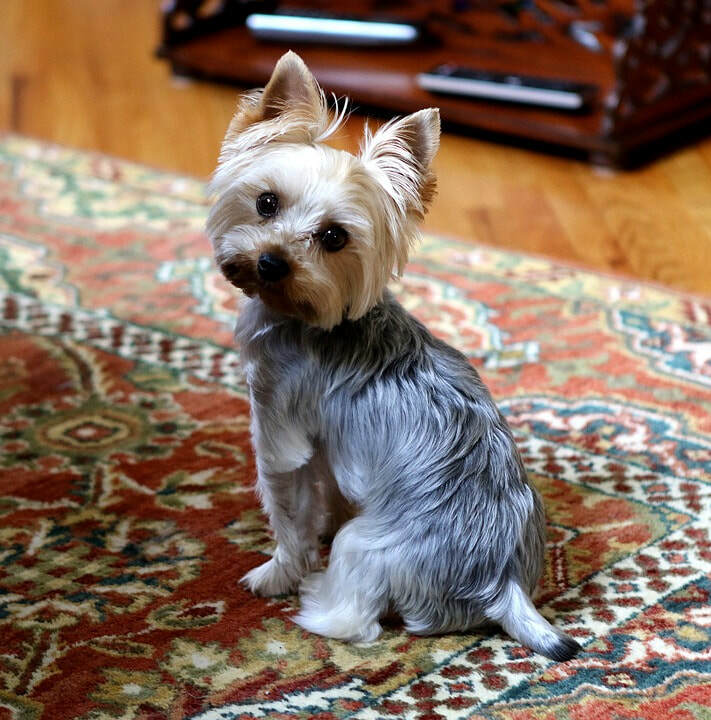 The hallmark of the Yorkie is its coat color: a clear shade of tan with a dark steel blue hue. This coat, which is fine, silky, long, glossy, and straight, may be cut in various styles, but is generally trimmed to floor length for dog competitions, giving it a neater and more elegant appearance, and easing its movement. PERSONALITY AND TEMPERAMENT: Although the dog may be small in size, it is bold, curious, and always ready for an adventure. Yorkies are known to be stubborn and can be assertive towards small animals or unfamiliar dogs, a reflection of its terrier heritage. And while the Yorkie has a tendency to bark excessively, making it an excellent watch dog, it can be trained to remain quiet as well. CARE: The Yorkie loves to exercise, often playing indoors without much encouragement. It should regularly be taken outside for short leash-led walks, however. The dog's long coat requires brushing or combing every other day to avoid tangles ot rubbish getting caught up in the coat. The Yorkshire Terrier is primarily an indoor dog - it is not a breed that should be allowed to live outdoors. HEALTH: The Yorkie, with a lifespan of approximately 14 to 16 years, is prone to minor health problems, such as patellar luxation. Occasionally, tracheal collapse, portacaval shunt, progressive retinal atrophy (PRA), Legg-Perthes disease are seen in this breed. To identify some of these issues, a veterinarian may run eye and knee tests, along with a liver ultrasound. 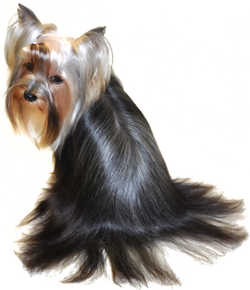 Silky Coats: A Yorkie with a silk coat has fine, humanlike hair that grows in a single layer with no undercoat. Yorkie's fur will hang perfectly straight off the body. It will not be wavy and will be very shiny Yorkie's fur will hang perfectly straight off the body. It will not be wavy and will be very shiny. 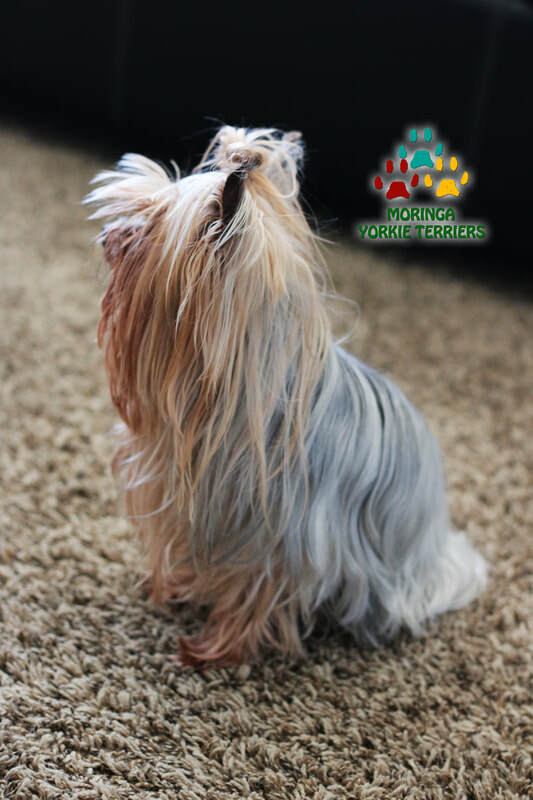 Cotton / Wooly Coats: Yorkshire Terriers with cottony coats usually have a large quantity of hair from the time they are newborn puppies and as they grow, the hair continues to grow in length and bulk. Blue tan, blue gold, tan steel blue. 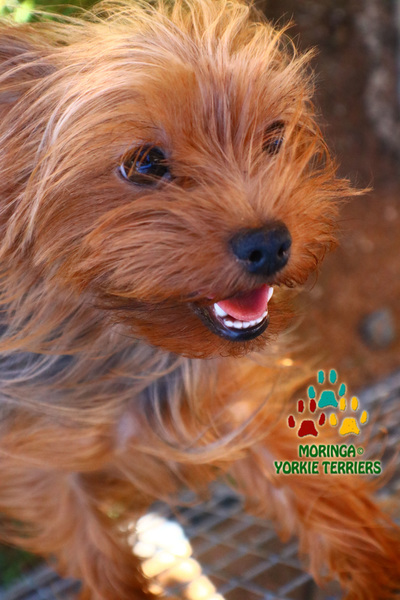 There are many other purebred yorkie color coats such as parti, biewer, chocolate, gold, blonde, black, white, merle and other mixed color coats. These other colors are results of recessive genes.